He appears in the Local, District, Supreme and Federal Court and Tribunals such as the CTTT and conducts mediations as a nationally accredited mediator. 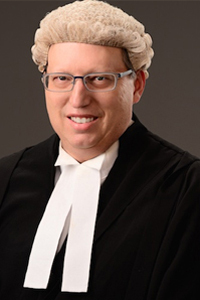 He was first admitted as a Legal Practitioner in NSW in 1999 and was first admitted to the Bar in 2001. He left the Bar in 2006 to join K.M Harkness & Associates which subsequently merged with E H Tebbutt & Sons. He returned to the Bar in 2010. He has presented papers to regional Law Societies, the City of Sydney Law Society and CPDS. He has recently completed a paper on statutory wills. He has appeared as a junior with Senior Counsel. Allan originally hails from South Africa where he was admitted as an attorney in 1992, articled at first tier firm Fluxman Rabinowitz before joining the Johannesburg Bar in 1994. Whilst requalifying in NSW, Allan worked at Freehills (now Freehills Herbet Smith) in a large scale litigation matter involving Pfizer. Outside of practising the law, Allan enjoys tennis and running (regularly participating in the City to Surf), cooking and reading.